Six Under-12 Academy teams will unite with six teams from Belgium, France and Germany this weekend to compete for a trophy at the Premier League Truce Tournament finals and remember those who died in battle one hundred years on from the end of the First World War. Boys from Arsenal, Burnley, Cardiff City and Sunderland won their respective national qualifiers at Armed Forces bases around the country on Remembrance Weekend last month to earn a place in the finals that start on Friday at Ypres, Belgium. Youngsters from Watford and Wolverhampton Wanderers will also be in Belgium thanks to their performances off the pitch. They won the two places available in an educational competition as teams completed projects on Walter Tull, a professional footballer and the first man of black heritage to become an officer and lead men into battle in the British Army. The levels of the projects on Tull from the various teams were of a high standard and the studies formed a key part of the clubs providing an education to their youngsters both on and off the pitch. 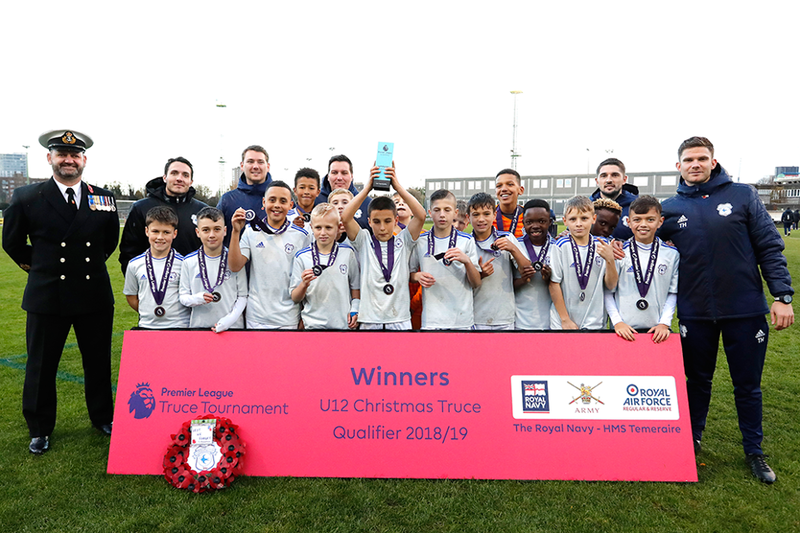 "We had an educational day about the tournament, and obviously the education project about Walter Tull," said Sam Hurrell, a Chelsea Academy coach, whose team competed at the Royal Navy base in Portsmouth last month. "So the boys had to go away and write a homework project about that, and when they came in and explained what they had written, you go, 'Wow, that was quite amazing to see that.' "
Even though Chelsea lost out to Cardiff at Portsmouth last month, the experience of commemorating the 100 years since the Armistice at an Armed Forces base was important part of their boys' development. "There's so much that we can tell and explain, but the fact that they're here at a navy base with soldiers in uniform, listening to poems, being part of that service, laying a wreath," said Hurrell. "It helps them to bring it to life and understand what it's all about." That will be especially true for the young teams going to Ypres. They will see where the soldiers fought and died more than a century ago and pay tribute to them in the Last Post ceremony at Menin Gate, a Remembrance service conducted every day since 1928. And alongside their opponents from Anderlecht, Club Brugge, Lille, Lens, Cologne and Hertha Berlin they will understand how football unified soldiers across the trenches on Christmas Day in 1914.